After some time with "Game-Designer´s Block", I finally started working again. I´m nowhere near finishing the final area, but I´m starting with the tileset and the level layout. Also, MichaelGabrielR finished his excellent "Super Mod" for Metroid: Confrontation. It replaces the music, tiles, backgrounds, and most importantly, the power suit design with a custom Super Metroid inspired one. This design might be the one to be used in AM2R, so feel free to try the mod out. Well, have fun playing the demo again. Progress is looking good. Thanks for some more images of the gravity suit. I'm looking forward to how you improve the main cave system. Very interesting. I'm glad that you are starting to make progress again. I hope that the tileset you showed for the egg's location wasn't the final, however. I think the cave where the egg is should have a much darker look. Also, I think you should make the egg slightly larger, as it doesn't really stand out at the moment. Anyway, that is one excellent Confrontation mod. 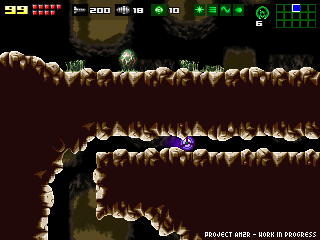 I really hope that you incorporate some of the tilesets into the darker parts of AM2R, as some of the tilesets you have right now are a little too bright for certain areas. 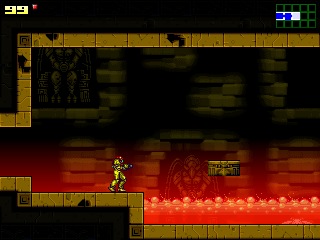 I would definetly like to see some of those new Chozo ruines tiles used in AM2R, as they look much more ancient and mysterious than the Zero Mission version. Anyway, you've been doing a great job with the project lately. Please take your time to make everything feel perfect. I'm going to have to say I disagree with Gridlock and say I love the egg. In the original, it sort of blended in - I didn't even see it the first time. It looks perfect, natural enough to blend in, and not loud and tacky so that it stands out like a sore thumb. Nice to hear you are back on track doc. Keeo up the good work. Having played the original more times that I can remember I have to disagree with Gridlock. I think the egg (and the egg's size) are both perfect. Looking good and carry on doing what you do best. Nice images. I like the mod MichaelGabrielR but when I was fighting Kraid, the music didn't restart when it finished, so I was fighting with no music. Just pointing that out. 2. Other than the song "Sick_Monster", WHY SO MUCH CLIPPING AND DYNAMIC RANGE COMPRESSION?! (it's essentially like shouting and all-caps) The loudness war is already a big-enough problem, but why are you VOLUNTARILY participating in it?! If you want to make a song louder, use the music.ini file. I'm not sure why *.ogg files aren't used instead. Perhaps because it's not native to Game Maker, but the Pro version can use dll's to do that. The whole point when creating those sprites was to make them compatible with the current engine. The Doc doesn't have to change a line of code to make them work and replacing some images shouldn't be that hard, so take it easy. Teines que descargar el Demo Original y despues reemplazar los archivos viejos con los nuevos. Hello doc. I have to say that before playing the mod I was a little worried about the new sprites. After playing on the other hand, I do feel much better about them but I think some of the poses, particularly the idle stances need to be tweaked a bit. Some of the body parts on samus seem to blend in when Samus' armor should be split up in between joints. I hope I explained what I meant clearly. They DO look great but they still need just a bit more work. Great job MichaelGabrielR! Great, Doc. It's looking good; nice progress. And good mod, Michael. This is Jasper (the guy with yellow font in the forums). so i'm still on the support side to use these new sprites for samus on the official AM2R game. I'm glad you are back on track. If you think about it, the cave where you find the hatchling is likely the place where the queen laid ALL her eggs, so while this would deviate from the original room drastically, I think it would be very appropriate to have shattered Metroid eggshell fragments strewn about everywhere. I think a good bit of slimy gooey-looking stuff on all the surfaces and the background of the room would be good too. After all, giving birth is not a clean procedure, no matter what the species. Um... wait, these AREN'T OGG vorbis files with an .mo3 extension? You DO realize WAV, MP3, and OGG vorbis files work natively... right? As for the loading lag thing, in my experience that was because my PC isn't that great spec-wise. Does it STILL lag, even on a newer PC? 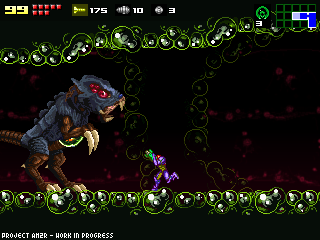 While I like the idea of the Super metroid samus mod, that particular sprite set looks... somewhat unsightly. Maybe if it were polished up some? I will check out the mod when I get back from vacation. Looks very good. Can't wait till your finished with the game. Looks like you have got that famous seen when u first spot the metroid egg done. Looking good Doc. Seeing segments that close to the end of the game gets me excited again. It's sad that I'm looking forward to this more than Metroid: Other M, but oh well. I'm sure Other M 'will' be very good and will make the wait for this game that much easier. The Power Suit from Zero Mission is much better. It both looks for realistic and her posture feels much more "elite." You should keep the Zero Mission suit. The other changes seem cool, though. Ive been following your progress for quite some time now and it's great that you find the time to keep us too updated on the progress with screenshots and such. Im usually hesitant about demos and betas but yesterday i got curious enough to try the Confrontation super mod and i must say that if the finished version will be anything close to that its going to be truly great stuff! The music caught my attention immediately, such atmosphere and beauty (saw the post about bitrates & clipping but you'll probably fix that anyway) and it fit so well with the graphical design as well. Very loyal to the original series in terms of these although its ages since i played them.. The movement seemed a little clunky and unprecise especially in quick jumping sequences but otherwise i have nothing to complain about. Good work Doc, and please keep us updated as you've done so far. Personally I like the not-Super Metroid themed sprites, they're more... attatched to the game I suppose. Looking good doc. I'm getting really excited, I actually dusted off my old Game Boy pocket and put M2ROS. Unfortunately the save battery is toast so I didn't play it for long. What's your progress look like in percentage, sorry for the impatience but this looks too good to pass up. Besides that, it's the first 2D Metroid since Zero Mission. It looks EPIC! I do not like the new suit sprite though. I like the MZM sprites better. But that is just my opinion! Download Metroid:Confrontation from this blog, download the mod and just replace the old files with the ones from the mod. Alternatively, you might want to read the mc_super.txt file that comes with the zip file of the same name. I'm Dutch, so srry for the bad English. I must say I'm not a fan of indie remakes of games, but you are doing a great job. If never seen such a good indie remake, it's almost as good as the real thing. I'm playing the whole metroid serie at the time, almost done with Super Metroid and then I have only one to go, Metroid fusion. First I really like the smoothness of the game and the graphics are top notch and feel are perfect. I like all the details, like the way you used things of GBA metroids to keep it a real metroid. Good job at, Shinespark, Shinespark Morph Ball, Wall Jump (even better then the game version because you can make it without salto) and the dying sprite. the rocket cannon, it looks like a picture upon the other canon, in the real game it's a smooth twist animation. IMO the explosions are to fancy, the bomb explosion is much more sprite like, I hope you make the normal explosions like the bomb explosions. If you sit and run, you stop for a second, it'll be cooler if you start running immediately. I didn't like the Ridley song, because ridley already has the best metroid song :P and why didn't the belly things of kraid stick into the wall, but at the end they did. And if you die you keep all your progress, that's real cool, something I really miss in the real games, so it would be cool if you keep that in your finished game. Because I think these little things could make your remake, the best of all. I wanna play the game soooo bad!! Success with all the work! For the super mod: I love the sprites.. the music wasnt so great though imo. The atmospheric parts were good .. but a little short and repetetive. The menu theme was nice but lacked the iconic Metroid Tune theme. The Boss fight music was terrible, I dont mind trance/dance/techno music but it has no place in a Metroid game. This game looks better and better every update. Keep up the good work, Doc. "This design might be the one to be used in AM2R, so feel free to try the mod out." Not saying the mod is garbage, It's actually pretty cool, but I'm not too fond of the new Samus. I never really liked the super mod for Metroid Confrontation. It makes the game way too dark and sinister. The music just gave me shivers. And the chozo statues look way to demonic. hello again i just played throught the whole mod. the main music could have been better but the kraid and ridly themes were great!!!! @fraroc I think dark and sinister was the idea. It's called a theme. And you're only noticing the demonic look of the Chozo statues NOW? They were like that WAY before the theme change. 1)New Samus falls too fast. Want to mid-air morph? Forget it. Want to use spider ball properly? Come back when you've lost a few hundred pounds and we'll talk. 2)If Samus is shooting forward, why is her arm cannon made to look like it's pointing slightly upwards? The sprite is a small issue, but it bugs me, and I want it fixed if I'm supposed to play through the game with it. Well it looks really good. Can't wait to paly this. I assume your going to make the final boss battle with the Metroid Queen a little long and really epic than the original. One thing I wonder is how your going to kill the Queen? My suggestion is from looking at other boss battles from other Metroid games is you should do some kind of phase battle with her before you get at her main health, the first phase you have to do is weaken the Queen's defences or shell by Missile bombardment. Second Phase you have to lay bombs in her core through her mouth when she's really weaken and has low health. At least something like that I don't know. I'm sure you have a lot of good ideas on how the final battle with the Metroid Queen should be. Good work! I wish you the best of luck so you can someday finish this awesome looking project. The screenshots are cool, but... I think that place should be more creepy, since it's the metroid hive, the final part of your adventure, and the deepest place of the planet. Think about the Alien movies the place with the eggs had a haze in the ground, and goo from the eggs scattered trough the place. The graphics in general are too bright because you are using graphics from the GBA games(which needed bright sprites because of visibility issues in the old LCDs), but since this game is coming to computer, the graphics should be more in line with Super Metroid. It's just my opinion though, and the game in general is looking really good and I can't wait to play it. Very nice work! We are all excited to see how it comes together. Is there any estimation of when this project will be completed, or if it's close to being completed? Why don't you make the new suit as an achiement award for after you beat the game? I kind of agree that the queen's layer needs to be darker than the screenshots you've shown. Perhaps the area could be made to look more like the caves in the Super mod. Sir, if i wore a hat, i'd salute you with it. Not layer, lair. RAWR! But yes. Super mod + gooey. And when Samus is walking around in there, you hear squish sounds. And when Samus shoots a missle or something at a wall in there, you hear a crackle-squish sound. Not really sure how you're supposed to make a crackle-squish sound(not even entirely sure what that sounds like), but you totally need that in there. Hi doc. The game is really awesome with the Zero Mission Power Suit, Varia Suit and Gravity Suit sprites. It looks much more awesome than the Super Metroid Sprites, not that I say they aren't good, but I think the Zero Mission suit sprites look much more awesome; so I recommend that you keep the good work with the Zero Mission sprites, I think it'll save you a lot of work and time because you already have them done. no please keep it zero mission style PLEASE!!! 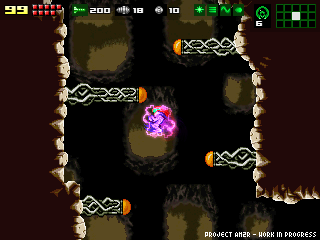 i dident like the feel of super metroid when i played it. it was a good game but the feel of the way the games was layed out was not good. so please keep it with zero mission style. you know on second thought the super mod gave the game hat dark and alone feeling that metroid 2 gave us when we first played it. so im not totally agenst it not. It's better have both mods in the game. What take so long? update relase already plese! yeah i know this doesnt mean a thing, but the super metroid powersuit makes her look more like a tank. the normal "unmodded" version makes her look much more professional. Not that I disagree, but just what exactly about a tank is unprofessional? You know what TANK stands for right? Do you guys have an estimate of maybe when it will be available?